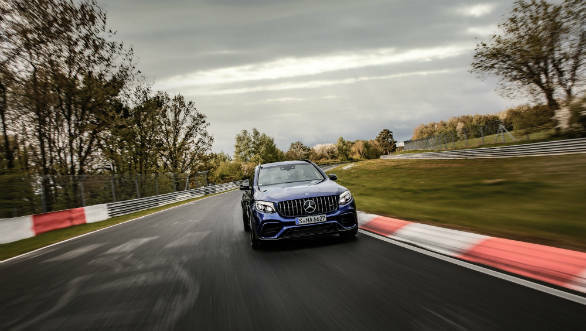 The Mercedes-AMG GLC 63 S is now the quickest SUV around the Nurburgring. It went around the 20.8 km and 73 turn loop in 7m 49.4s. This is two seconds quicker than the previous record holder, the Alfa Romeo Stelvio Quadrifoglio, which set a time of 7m 51.7s in September 2017. The AMG was being driven by Mercedes-AMG development engineer Markus Hofbauer. The GLC 63 S is powered by a 4.0 litre twin turbo V8 putting out 510PS and 700 Nm. This gets from 0 to 100 kmph in 3.8s and up to 280 km/h (with the optional AMG Driver's Package). The Stelvio Quadrifoglio is also a similarly sized five-seater SUV derived from the Giulia sedan. It is powered by a Ferrari developed 2.9 litre twin turbo V6 which makes 505PS and 600 Nm, but is about 45 kgs lighter. The Mercedes-AMG GLC 63 S is not listed for sale in India but its less powerful GLC 43 cousin can be bought in the country.